The combination of the LIFA (Lambert Instruments Lifetime Attachment) with laser-TIRF enables�lifetime imaging microscopy (FLIM) while�detecting�just the first 100nm�of the sample. TIRF FLIM images provide better resolution and are more specific regarding lifetime values per region of interest which is important e.g. in case of FLIM FRET studies of the cellular�plasma membrane. Reference: Paper describing the LIFA in TIRF mode; Beatson Institute for Cancer Research, Glasgow, UK. A directly modulated laser diode is directed by a similar control unit and same software package as the standard LIFA system. The laser diode can be offered as single-wavelength, as well as multi-wavelength and several lines are available like 405nm, 445nm, 473nm, 488nm, 639nm. The laser light is connected to the laser-TIRF attachment directly. Different models have been evaluated in combination to the LIFA system: Leica, Nikon, and Olympus. The laser-TIRF is mounted to the epi-attachment of the microscope. The modulated ICCD camera (LI2CAM MD) is mounted to the camera port of the wide field fluorescence microscope. 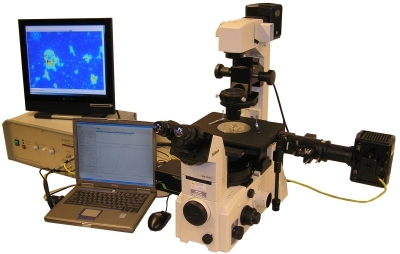 The system is offered as one package with the LIFA system; however, users can also use their own laser-TIRF set-up and wide field fluorescence microscope to which the LIFA system will be attached. The high-resolution modulated image intensifier is the key component of the LIFA. The gain of the image intensifier can be controlled by the voltage across the MCP and is typically in the range of 100 to 10,000 times. Also the voltage between cathode and MCP can be changed in order to control the gain. During modulation, the gain is modulated via the cathode voltage. The image intensifier is fiber-optic coupled to a CCD camera and integrated in the LI2CAM MD camera that is made by Lambert Instruments.�Optionally we offer a�lens-coupled intensified CCD camera. The intensified CCD camera LI2CAM MD is very compact and has a higher gain than the lens-coupled combination as a result of the more efficient and compact fiber coupling. The lens-coupled combination however allows easy detachment and exchange of camera from image intensifier by the user. This unit supplies the RF modulation signals at controlled frequency (up to 120MHz), amplitude and phase difference to the laser light source and to the image�intensifier. The unit also supplies the DC power and high voltage to�laser and image intensifier. An extra output to drive an external modulator is available, as well as monitor outputs to check the modulation signals. The user-friendly software is developed by Lambert Instruments. With this package you can acquire single- and multifrequency lifetime images, process them and do analyses by statistics or polar plot. Time series can be done as well, for which the frequency domain FLIM is highly appropriate because of its fast acquisition possibilities. It automatically recognizes�connected devices. 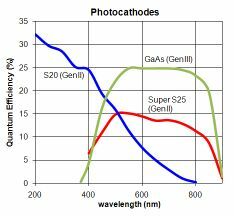 Among others different light sources are integrated in LI FLIM like the�LEDs, the directly modulated laser diodes, and the�Cobolt DPSS laser (not modulated). Additionally�various�detectors are integrated like the standard LI2CAM MD, but also the Andor Ixon EMCCD and�a Roper Scientific / Photometrics camera for the lens-coupled option of the LIFA. Moreover the nanopositioning system NanoF100 (z-stepper) is integrated in the software which is ideal when using the LIFA with the Yokogawa spinning disk. Customers receive the password for the newest software release which can be downloaded from the LI FLIM software page directly.